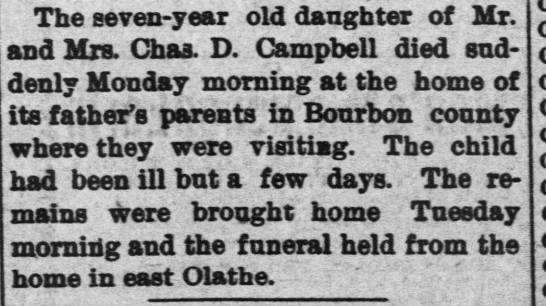 The seven-year old daughter of Mr. and Mrs. Charles D. Campbell died suddenly Monday morning at the home of its father's parents in Bourbon county where they were visiting. The child had been ill but a few days. The remains were brought home Tuesday morning and the funeral held from the home east of town. 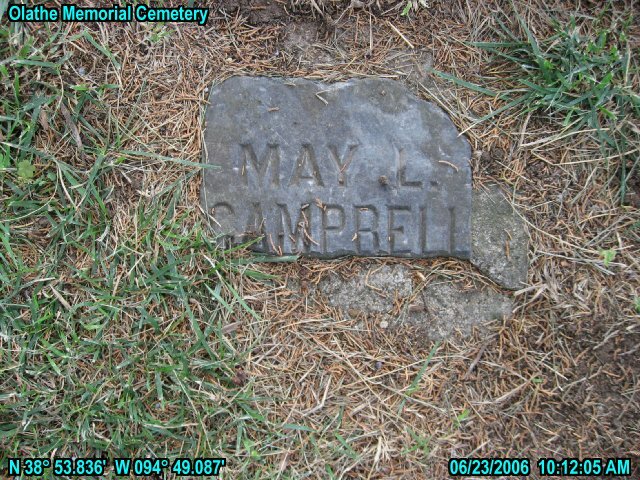 Died at the residence of her grandparents, Mr. and Mrs M. W. Campbell, at Fort Scott, on the morning of July 20, 1903, May Louise Campbell, daughter of Mr. and Mrs. Chan Campbell of Olathe. aged 7 years, 6 months and 18 days. Little May was taken sick on July 15. She was kindly watched and cared for by her anxious parents and friends who entertained hopes for her recovery but on Monday morning. July 20, she folded her little arms, closed her eyes and sank quietly into the sleep that knows no waking. The bereaved parents and family have many sympathizing friends in this vicinity. So pure and so free from all sin. With one we dearly loved. In the Father's bright home above. She has climbed the golden stair. Please share your memories of May LouiseFort Scott.